Get on board with the latest in water sports fun. 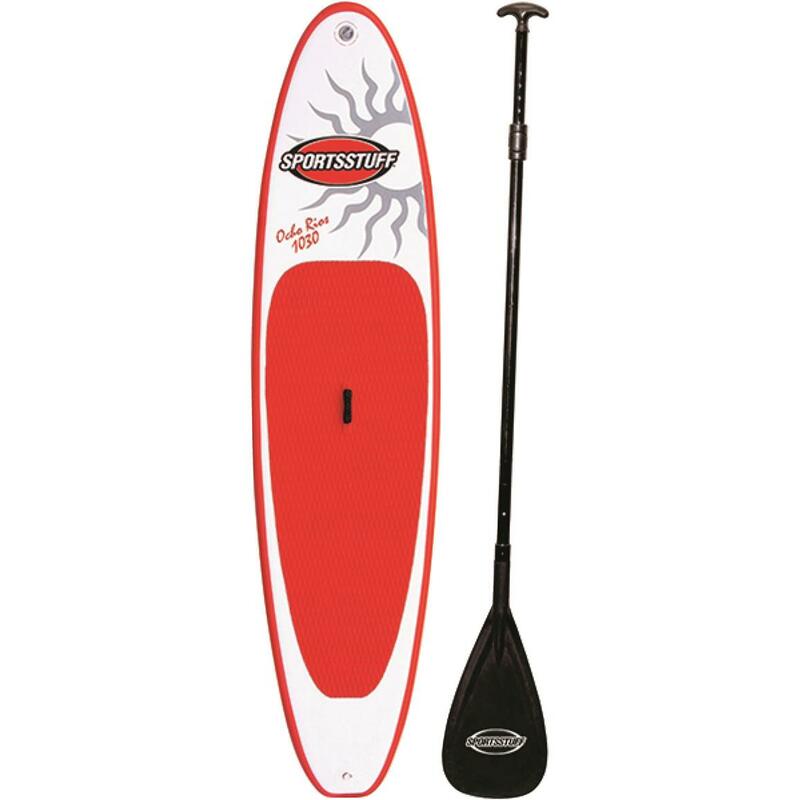 The Sportsstuff Ocho Rios 1030 Inflatable Stand Up Paddleboard (ISUP) with Paddle is a stroke of genius. Paddleboarding is the perfect balance of fun and fitness and now, even a lack of storage space won't keep you from jumping on board this growing trend. The secret to the versatility of this ISUP is the specialized air valve it uses to hold up to 15-lbs. of pressure along the drop stitch interior construction. The Ocho Rios 1030 ISUP with Paddle is perfect for beginners and all-around cruising on gentle water. Two main features give this ISUP the feel of traditional board and the versatility of an inflatable. First, is the easy to operate air valve system that makes it possible for you fill the air chamber quickly with either a hand pump (included) or an electric pump. An air gauge lets you know when you've hit the maximum pressure needed. Next, the drop stitch interior and PVC layer construction creates a rigid surface that rivals traditional stand up boards. and you'll be able to store your 10' Stand Up Paddleboard in any closet. Fully inflated this ISUP supports up to 220 lbs. Board Dimensions: 10.5' x 30" x 4"h.